Amazon Echo Dot (3rd Gen) Review: Bigger, better and louder! The latest smart speaker comes with improved design language, better sound output and all the goodness of Amazon Alexa. But, does it make sense to invest in this smart speaker? Let’s find out. Amazon recently introduced its next-generation of Echo smart speakers in India. The brand introduced Echo Dot, Echo Plus and Echo Sub at a price tag of Rs 4,499, Rs 14,999 and Rs 12,999 respectively. Out of Echo Plus and Echo Sub, Echo Dot should appeal to the masses. The latest smart speaker comes with improved design language, better sound output and all the goodness of Amazon Alexa. But, does it make sense to invest in this smart speaker? Let’s find out. Amazon has gone Google way by implementing fabric clothing in the latest Echo Dot speaker. 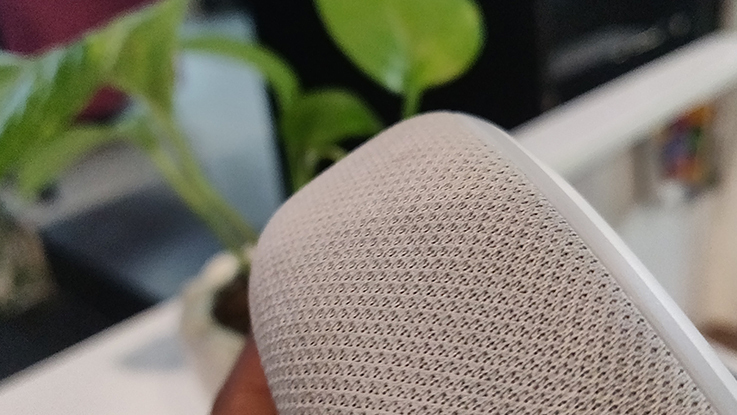 The fabric looks a bit similar to the Google Home Mini, though the design is completely different. At the top, you four buttons which are meant to control volume, mute the microphone and invoke Alexa voice assistant along with four microphones. There is a LED ring that runs around the top of the speaker. It basically turns blue when you ask Alexa. Then there is greenish light, which indicates the volume level and red means that the speaker is on mute. The back of the device features a power port as well as an auxiliary port for connecting the speaker to different speakers. The bottom of the speaker comes with a rubber coating, which provides the much-needed grip on a slippery surface. That said, the Echo Dot looks much premium and bigger as compared to its predecessor and you choose different colour shades ranging from Black, Grey and White. 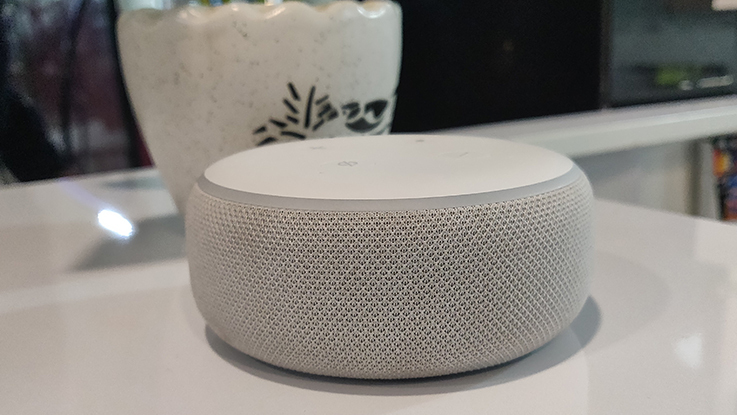 The 3rd generation Echo Dot comes loaded with improved sound quality as compared to its predecessor. It now uses a 1.6-inch driver, which helps to produce louder sound as compared to the previous generation model. In our testing, we found out that audio quality is excellent and you will not feel any distortion at high levels. The speaker gives a deep bass with high and mids giving decent feedback. Setting up the new Echo Dot speaker is pretty simple. All you need to do plug the speaker to the charging point with the help of the adapter. Then you need to download Amazon Alexa application from Google Play Store or Apple App Store and then tap the plus icon in the Device Section. Follow the instructions to set up the speaker, which hardly takes a minute or so. Once done, you are good to go. 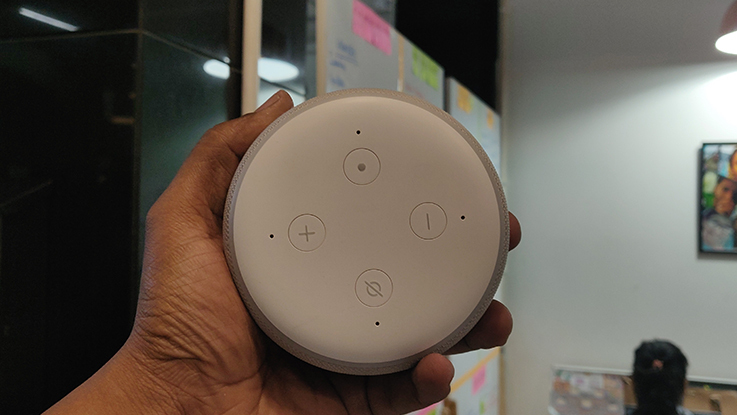 The good thing here is that Alexa recognises the Indian accent better now and in our testing, we found out that it was able to understand our command quite easily. You can ask Alexa for different things like creating a shopping list on Amazon, book Uber cab, listen to music and more. You can also customise the hot word “Alexa” with something different. The virtual assistant does an excellent job in recognising the command and giving the answer accordingly. Plus, one can enable different Alexa Skills right from the Alexa application. You have to do anything with a simple command. For example, you can merely ask Alexa to play Imagine Dragons best songs or specific genre of music like Rock, Classical, Bollywood and more. However, we did notice that you need to speak louder to give a command when the music is playing at a higher volume. To conclude, the Amazon Echo Dot is smart enough to answer most of your queries. The device comes with a bigger design and better sound quality, which is enough for an average room size. However, you can always connect it another Bluetooth speaker for an immersive listening experience. Alexa works perfectly fine and pickups Indian accent quite smoothly. Overall, if you want to try a smart speaker and does not want to spend a huge amount than this smart speaker from Amazon is ideal for you.